THEY have been partying long and hard ‘doon the toon’ since Newcastle clinched the Championship crown in dramatic fashion on Sunday to secure an instant return to the Premier League. And you have to check out a YouTube video (see link below) which encapsulates not only the celebrations but the build-up to the great event, as well as the match highlights. Newcastle’s 3-0 win against Barnsley didn’t look like it was going to be enough to claim the title – until a late Aston Villa equaliser against Brighton sent St James’ Park into a frenzy. Fantastic scenes and a fantastic achievement by Rafa Benitez, who chose to stay on at Newcastle after relegation a year ago when many thought he would jump ship. The former Liverpool and Real Madrid boss stayed loyal to the cause and deserves every acclaim going. Magpies’ fans are desperate for him to stay on once more. Despite sealing the title, Rafa’s work for the season was still not done as he made an unexpected appearance in the dressing room ahead of the Under 23s semi final showdown with Fulham. After the players had returned from the warm-up Benitez was waiting for the youngsters to wish them luck before the clash at St James’ Park. 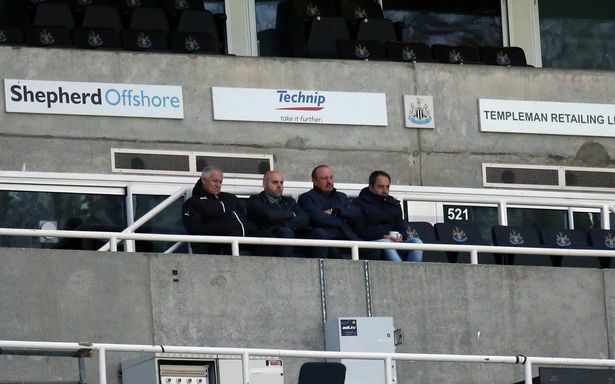 Benitez then took his place in the Milburn Stand to watch the 2-0 win which booked the Magpies a place in the play-off final against West Ham on Friday night. It was massively appreciated, certainly by U23 boss Peter Beardsley who, quoted in the Chronicle – http://www.chroniclelive.co.uk/sport/football/football-news/rafa-benitez-shows-class-surprise-13006276 – said: “The gaffer was here with his staff. That’s massive for these kids. And that’s just one of the reasons why Mike Ashley and Co must move heaven and earth to keep him at the club – and provide him with the funds to take Newcastle to the next level.